When climate scientists go out on the streets and protest, you know something is up. 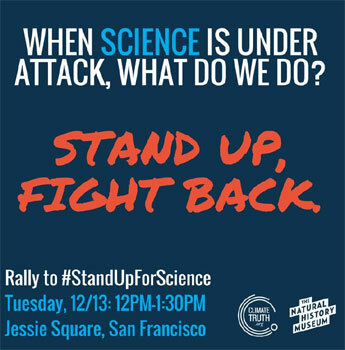 Today, they are rallying outside the annual American Geophysical Union annual conference in San Francisco, joined by allies from the climate movement. 26,000 people are attending the conference. For many years, scientists have been subjected to disinformation from fossil fuel interests and paid-off politicians, and now there is a new challenge: the agencies in charge of protecting our environment will be led by the very people who wish to destroy it. In a scary move, the Trump transition team asked the Department of Energy (DOE) to deliver a list of employees and contractors who have worked on climate policies under Obama. DOE is refusing to list names. who was involved in developing social cost of carbon metrics, which requires agencies to weigh the climate impacts of federal projects as part of the evaluation process. information on research activities, the basis for DOE statistics, and its loan programs. Clean Energy Ministerial: brings energy ministers from 23 countries together to advance clean energy. “This looks like a scare tactic to intimidate federal employees who are simply doing their jobs and following the facts. I am sure there are a lot of career scientists and others who see this as a terrible message of fear and intimidation – ‘either ignore the science or we will come after you,'” Rep. Elijah Cummings (D-MD), the top Democrat on the House Oversight and Government Reform Committee, told Washington Post. Warning against “a return to political witch hunts of the 1950s, President-elect Trump must instruct his transition team to cease this profoundly anti-democratic behavior immediately,” says David Cox, President of American Federation of Government Employees. Scared of potential political interference, scientists are feverishly copying reams of government data onto independent servers to protect decades of crucial climate measurements, from sea level rise to statistics on wildfires, reports Washington Post. Database experts are helping to organize mountains of data and to house it on free servers. Offers have come in to fund these efforts and the Climate Science Legal Defense Fund is offering pro bono legal assistance. This weekend, a “guerilla archiving event” will be held at University of Toronto to catalogue key environmental data from the Environmental Protection Agency on climate change, water, air and toxics programs. Republicans have been de-funding and attacking environmental and climate programs throughout the Obama presidency – this is their chance! Next Next post: Will Dems Have the Nerve to Confirm Garland As Supreme Court Justice?